← Meeting, meetings, meetings. Locations, locations, locations. Its Friday again, and again I am going to look at another object I have come across in the Vernon Park Natural History collection. It is a slow process and still I am only on box 14, but the boxes are starting to disappear and a noticeable dent has been made. This weeks Find It Friday object is possibly my favorite object in our collection. This is a jaw that once belonged to the marine reptile Ichthyosaur. These predators lived in the oceans from the mid Triassic until the Late Cretaceous, becoming extinct an estimated 90 million years ago. They shared many features with dolphins, notably their long snout, however the teeth bursting out of this mouth makes me think it was a lot more on the ‘snappy’ side than the dolphins of today. 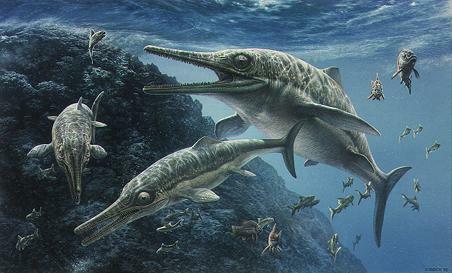 An artists impression of Ichthyosaurus. The origins of this particular fossil are unknown, and the possibility of it even being a cast is there, but it is still a great object. It has been severely damaged in the past, as you can see it has been glued back together after being broken in to numerous parts. Despite that, the jaw and snout like shape are still obvious and the teeth remain intact. The first complete Ichthyosaur fossil was discovered by Paleontologist Mary Anning in 1811, on the Jurassic Coast in Lyme Regis. Anning was a pioneer in not only fossil collecting but also for women in science and her achievements are subsequently extremely inspiring. Before succumbing to breast cancer at the young age of 47 Anning went on to make huge discoveries in both the Ichthyosaurus genus and, possibly the most well know prehistoric marine reptiles, the Plesiosaurs. On Tuesday 27 August Manchester Museum is holding a drop in session with their curator of Earth Sciences, David Gelsthorpe and he will be talking about their Ichthyosaur fossil. The fossil is a new addition to their museum this year and I am hoping he maybe able to tell me a little more about ours as there is literally no information with this object or on its Modes record. This drop in session is part of the Hidden Treasures event; a national initiative to celebrate collections in UK museums and archives presented by the Collections Trust. There are literally loads of open events over the course of six days throughout the country and they all seem very interesting; I am hoping to get to as many as possible, so should you! The Jaw in shot with an Ichthyosaur paddle and a small Mammoth tooth. This entry was posted in Find it Friday!, Vernon Park and tagged Collections, Collections Trust, Curatorial Services, dolphin, Earth Science, find it friday, Friday, Geology, Ichthyosaur, Jurassic Coast, Late Cretaceous, Lyme Regis, Mammoth, Manchester Museum, Mary Anning, MODES, Museum, Palaeontology, Stockport, teeth, tooth, vernon park, woolly mammoth. Bookmark the permalink. 4 Responses to Find it Friday! – Week 12.